Lake Erie is the smallest of the Great Lakes in volume (116 cubic miles). The basin is intensively farmed and is the most densely populated of the five Great lakes. Consequently it is exposed to the greatest effects from urbanization and agriculture. It measures about 241 miles across and 57 miles from north to south, with a surface area of just under 10,000 square miles. The average depth of Lake Erie is only about 62 feet (210 feet, maximum). It therefore warms rapidly in the spring and summer, and frequently freezes over in winter. The drainage basin covers parts of Indiana, Michigan, Ohio, Pennsylvania, New York and Ontario. Because of its fertile soils, Lake Erie is the most productive of the great lakes. The lake's main fish species include walleye, yellow perch, smallmouth bass, chinook salmon, coho salmon, rainbow trout, brown trout, northern pike, largemouth bass and carp. Lake Erie is the warmest and most biologically productive of the Great Lakes, and the walleye fishery is widely considered the best in the world. Every year tons of walleye are harvested from the lake, both from recreational angling and commercial fishing. 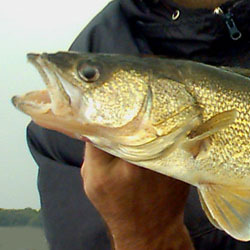 The average walleye is a whopping 5-6lb with 10-12lb fish caught regularly. The walleye are caught trolling along drop offs and mid lake humps. Most productive lure is the famous erie deary, usually tipped with a whole worm or minnow. Deep diving crankbaits trolled in the same areas also produce well. Maybe the tastiest table fair around, Lake Erie is full of perch. Tons are taken annually in commercial fishing nets. Anglers also fill their quotas as well, especially in the spring, when perch come inshore to spawn. Public docks are shoulder-to-shoulder this time of year, with jumbo perch hitting almost anything, although a simple bobber and worm or live/salted minnow is the most popular method of catching them. Boat anglers, usually fish near bottom with egg sinkers and 2-3 hooks baited with minnows and worms. It's not uncommon to land 2 or even 3 fish at once, when the perch schools are thick. With the introduction of invasive species like zebra mussels and gobies, the Lake Erie smallmouth bass population has thrived. The clearing water due to the actions of zebra mussels has increased both light penetration and visibility creating a perfect habitat for smallmouth bass. The gobies have further enhanced this fishery, since smallmouth bass forage heavily on gobies, which like to inhabit rock piles and boulder flats, the same areas where Lake Erie smallmouth bass feed. Lures which imitate the gobies can be very productive. Most anglers drift tube jigs in smoke, green and purple hues. Live bait fished near the bottom, usually minnows or crayfish can also be deadly. 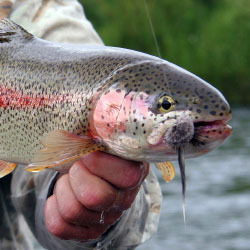 The most common trout in Lake Erie is the rainbow trout or steelhead. Caught using the same methods as for salmon, many charter captains target this majestic fish. A powerful fighter and excellent eating, makes this a popular gamefish on Lake Erie. In spring, when steelhead migrate up rivers to spawn, shore anglers enjoy a bonanza of fishing opportunities, since the lake's basin is rich with rivers and creeks. Float fishing or bottom fishing with roe can be very productive this time of year, especially along river mouths. Fishing is usually best at dawn. 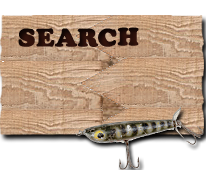 For more information visit the Lake Erie Fishing Forum. DRAINAGE BASIN AREA: 30,140 sq. miles / 78,000 sq. km. (including islands): 871 miles / 1,402 km. Each detailed map provides depth, contours, structure, boat ramps, and updated fishing information. Lake Erie fishing maps also include lake info such as gamefish abundance, forage base, water clarity, weedline depth, bottom composition, complete latitude/longitude grid lines and dozens of GPS waypoints & coordinates.